New Advanti Racing S1 & Konig 'Dial In' 15x8 and 15x9 Wheels! - Page 13 - Miata Turbo Forum - Boost cars, acquire cats. Get requests all the time to see these Storms in 17 inch on NA/NB....here you go. Advanti Racing Storm S1 15x8, photo courtesy of customer Erik N.
Guys, new KONIG DEKAGRAM and AMPLIFORM arrived Friday, started shipping TODAY! Numerous sizes and colors for all years of Miata/Fiat 124. See the site for what sizes and colors have arrived, we will be making the choices 'live' as they get unloaded etc. First shipment is limited and we expect demand will sweep away the fun new choices quick! Which do you guys want to see pics on car first? We will likely get that done this week, will be double checking brake clearances too, both these made to clear our big brakes, we supplied our templates during the design process. Matte Bronze back in stock! This Matte finish bronze is exclusive to Good-Win Racing, my bet is these are gone within a week and then next shipment will be late May. 16x7.5 Storm S1 Back in stock guys! Santa arrived early! Website says 15x10 first batch ships January, but we just got notice they are arrived to California. Pre-Orders start to ship TODAY, figure 2 days just for us to get all those out. Those with preorders check your email for tracking starting tomorrow. Going to flip the switch to 'IN STOCK' today! And here is Dekagram 15x10 in GREY. 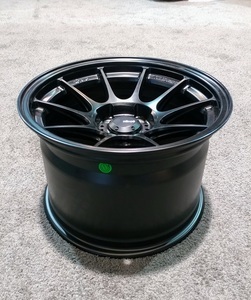 Quick Reply: New Advanti Racing S1 & Konig 'Dial In' 15x8 and 15x9 Wheels!